The consultation will run until Thursday 30 June and will allow everyone – from relevant organisations, to interested members of the public – to contribute and have their say on how these changes should best be implemented. Currently, two thirds of people who apply to become a nurse aren't accepted for training. The proposed changes will create up to 10,000 more nursing, midwifery and allied health professionals training places by the end of this parliament, allowing universities to accept more appropriately qualified applicants than they currently do. Since the wider reforms to higher education our universities are offering more places and those from disadvantaged backgrounds are more likely to access an undergraduate degree. Our proposed reforms will extend these benefits to nurses, midwives and allied health professionals, who have so far been excluded from these benefits. It is vital that the changes are implemented in the right way, which is why I would encourage as many people as possible to contribute to the consultation. The proposed changes will also offer students typically around 25 per cent or more financial support while they study. Although the number of nurses in the NHS has been steadily increasing, it is clear that further work needs to be done so a proposal to offer training for more nurses, midwives and allied health professionals needs to be carefully considered. Questions have been asked about the impact the policy may have, which is why this public consultation is important to ensure any change is implemented in the best possible way. I would encourage all nurses, midwives and allied health professionals to consider the recommendations made and contribute to the consultation. 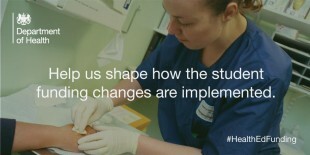 The changes are part of the Government’s plan to ensure the NHS can adapt to the changing needs of our population, train more nurses in England, and reduce the reliance on agency and overseas staff, and follow the reforms to wider education funding. Since those changes, university application rates have risen to an all-time high, and there have been more applications from disadvantaged students than ever before. Health Education England is responsible for ensuring the NHS has the right people with the right skills, values and behaviours in the right place at the right time. This mission remains unchanged by the new funding arrangements for nursing and allied health professional university fees which have the potential to increase the number of graduates available to the NHS by more than is possible under the current arrangements. Our job, with Universities and with the NHS is to ensure that we continue to recruit high quality graduates to the service to support patients with safe, high-quality services in the future. We encourage everyone with an interest in delivering these services to patients in the future to make their voices heard in response to this consultation. To participate in the consultation, please click here.